"It feels great. Up to this point I've felt that my post-collegiate career has been a disappointment. To get this win is huge." - Sean Quigley after winning his first US Championship at the Stratton Faxon New Haven 20k. Deep field at New Haven 20k on Monday. Predictions? Is Bernard Lagat the most handsome Kenyan-born runner of all time? Sean Quigley And Magdalena Lewy Boulet Win US Titles At Stratton Faxon New Haven 20k Sean Quigley got his first US title and $8,000 in his first race over 15k as he triumphed over Mo Trafeh. Olympian Magdalena Lewy Boulet won the women's title over unheralded Stephanie Rothstein. *On The Boards: Deep field at New Haven 20k on Monday. Predictions? Songoka (KEN) And Ogi (JPN) Win Coolest Rock 'n' Roll Va Beach In History Cool temps in the mid-60s were a gift to runners. 2009 Philly champ and Employee #1 vanquisher John Crews was the top American male in 9th (66:23) as he prepares for Baltimore in October. *Bolt's Book Is Out: Excerpt - Bolt: "If there were medals for partying I'd have won them all." Another Quality Photo: Arkansas Top 5 Cross Line Hand-In-Hand: One-Page Recap Of Opening Weekend NCAA XC Results USTFCCCA put together this page which allows you to see what Oregon, Stanford, Washington, Arkansas and others were up to in this weekend's opening glorified practices races. Kipketer Says Rudisha May Be Able To Go Sub-1:40 Rudisha is running the Continental Cup on Sunday. David Rudisha The Star Of 2012? 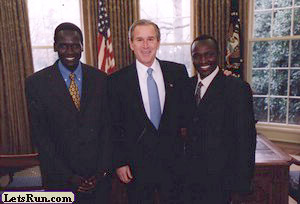 The article also talks about James Templeton, Rudisha's agent, discovering Rudisha in 2005. London And Chicago Champ Shobukhova To Face Mikitenko In Chicago To Likely Decide World Marathon Majors Title NY has Geb but Chicago did a great job with its fields on both the men's and women's fields. Drug Cheat Justin Gatlin Runs 9.81 - Wait, Make That 10.15 The clock stopped at 9.81 and confused everyone for a brief moment. WADA Reports Gene Doping Test May Be In Place For 2012 Games Two groups of scientists have developed separate tests, one of which can detect gene doping as far back as 56 days. Concerns are already high that gene therapy may have crossed over from legitimate medical applications to the world of performance enhancing for sports. Shot Putter Milan Haborak Banned For Life After 2nd Doping Positive Haborak was caught for stanozolol, the same relatively crude steroid Ben Johnson was busted for back in 1988. "Niggles" And Successful Year Cause Mo Farah To Pull Out Of Commonwealth Games The concept of getting slaughtered by Kenyans probably didn't help things either. LRC 2010 NCAA Cross-Country Pre-Season Polls: Stanford And Villanova On Top It should be a great year on the XC fields across America, as a lot of teams on both the men's and women's teams think they can contend in Terre Haute. On the men's side, Stanford, Oklahoma State, Oregon and NAU all have a ton of guys back. Villanova is a stronger #1 on the women's side, but the UW Huskies will want to have something to say about that along with LRC fan #2 Oregon. *USTFCCCA Pre-Season Coaches Polls Released Stanford and Villanova #1, as in the LRC polls. Peter Snell & Murray Halberg Remember How They Changed The Sport Forever 50 Years Ago Thanks to their hard work and Arthur Lydiard, distance training was changed forever as high mileage came into play. Lydiard Had Special Knack For Getting Best Out Of Athletes Not only did he revolutionize training, he also was good psychologically. Justin Gatlin: "Guilty or not, I've turned the page." We thought he had a strange answer in this BBC radio interview as well. 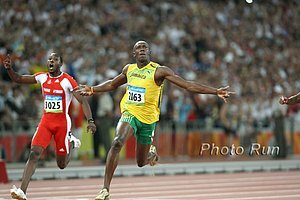 Nick Symmonds Wins One, Tyson Gay Crushes Nesta Carter Gay and Carter are the co world-leader in the 100m, but in 2010 Tyson Gay is clearly the world's top sprinter and he showed that by crushing Nesta Carter. Nick Symmonds got his first European win of the year and Morgan Uceny went sub-2:00 again but finished 2nd. *Video Of Tyson Gay's race His last 20m are incredible. Watch at the link to the left or on the right hand side of this page. 16-Year-Old Brit Charlie Grice Tells Us How He Ran 2:21 For 1,000 To Grab World Youth Olympic Bronze He's a talent we are fond of but don't like how he uses the term "my first Olympic experience." The youth Olympics are not the Olympics. 2006 European 10k Champion Jan Fitschen Moving Up To The Marathon Amazingly, the German's PR is just 28:02.55 and yet he's a European champ. LRC Week In Review This week, we compare Molly Huddle's and Bernard Lagat's American records to all of the other current mid-d and distance records, praise Asbel Kiprop while comparing him unfavorably to Ryan Gregson and Andrew Wheating, give props to Fasil Bizuneh and start to talk about the fall marathons in Chicago and New York. Justin Gatlin Race #4 10.06 (10.14 Unaided), Caster Semenya Runs 2:07 Gatlin ran his fastest time of the year, although when you adjust for wind and altitude, it's worth 10.14. The best news for Gatlin was he was only .03 behind Yohan Blake (who suffered a mild injury at the end of the race). Caster Semenya didn't show up and Sara Hall ran a 10:00 steeple. LRC Rudisha 1:41.01!!!!! One week after he ran 1:41.09 to take down Wilson Kipketer's world record, Rudisha took to the famed Rieti track and set the 8th world record ever on it by running a 1:41.01, coming up just short of the first 1:40 clocking. The first four all set personal bests, including American Nick Symmonds. Recommended Read: After a quarter of a century, Koch remains untouchable This article from the Independent talks about how all the women's WRs from 100m to 800m were set in the 1980s, including a 47.60 400m and a 1:53.28 800m. *Who also has never heard of Ecuadoran Bayron Piedra? Bernard Lagat, 6 years older than the next oldest competitor in the field and doubling back after a 51-second closing lap on Saturday, again benefitted from incredibly slow pacing as he doubled his weekly earnings to $60k to highlight day 2 from Croatia. Other big winners included a super-excited Blanka Vlašić and a bored unchallenged David Rudisha. Big losers included the Americas, who fell in the team standings to Europe and Nancy Langat, who seemed to attempt a take down of the leader as she fell with 10m to go in the women's 1,500. Day 1 Recap Of Continental Cup: Lagat Wins, Kiprop Fizzles Bernard Lagat and Asbel Kiprop both showed us from different extremes why the Continental Cup should be on every athlete's schedule because it gives them an experience they rarely get - championship running without rabbits. Lagat is a master without rabbits and he blasted a 51-second last lap to win the 5,000m title. Kiprop, after leading the first 2 laps, got boxed in with 400m to go and then basically quit the last 200m. He may have the Olympic gold but was only 4th at Worlds (a half-second mistake kills you in a tactical race). American Leo Manzano was boxed in as well, but kept fighting and finished 3rd. In the women's 3k, Meseret Defar blasted a 58.38 final lap for the win and Shannon Rowbury went sub-60 for 3rd. In other action, Jeremy Wariner ran fast again (44.22), Christophe Lemaitre won the 100m and Christian Cantwell the shot with Dwight Phillips in the long jump. Nick Willis 1:46.89, Alan Webb 1:48.34, Andrew Ellerton 1:46.77 In Italy The comebacks of the stud milers continue. IAAF: Day 1 Preview Manzano vs. Kiprop at 1,500 is one of the highlights. IAAF Men's Preview Tyson Gay is running, but only in the 4 x 100, giving Christophe Lemaitre a chance in the 100. Wallace Spearmon and Jeremy Wariner are running, as is David Rudisha, Asbel Kiprop, Leo Manzano and Bernard Lagat (3k and 5k). Women's Preview The top 2 female sprinters, Allyson Felix and Veronica Campbell Brown, basically avoided each other all year and both are skipping the Continental Cup (VCB missed most of all the big meets this year because of $). However, the long distances are stacked with Nancy Langat in the 1,500, Meseret Defar in the 3k, and Tirunesh Dibaba in the 5k. Boys Teams Rob Monroe's team rankings go an impressive 50 deep. American Fork (Utah) tops the boys pre-season chart. Girls Teams Defending Nike Cross Nationals team champs Fayetteville-Manlius (New York) looks like the girls team to beat once again. Top 25 Individual HS Boys Long-time DyeStat correspondent Steve Underwood gives his take on the best high school harriers in the nation. 8:44 2-miler Joe Rosa (also 14:56 course record on the notorious Holmdel 5k) heads the boys list over returning Foot Locker champ Lukas Verzbicas. Top 25 Individual HS Girls Superstars Aisling Cuffe (10:02 2-miler) and Chelsey Sveinsson (if fully recovered from injuries) are expected to wage a strong battle for 2010 supremacy. New Haven 20k (US 20k Champs) On Monday Brett Gotcher got it rolling here last year. He won in New Haven then ran 2:10:35 in Houston. He's back to defend. $15,000 Kauai Marathon Challenge For Sub-2:30 Marathon The winner is guaranteed $2,500 and the $15,000 is split among everyone else who breaks 2:30 (men) or 2:45 (women). If you're running semi-pro and want a good vacation, this seems to be the palce to do it. Italian Meet Director Blasts Semenya After Her Manager Says Fatigue And Illness Caused Her 2:07 The Italian is our jerk of the week, as he said, "There's no certainty that she did it on purpose. I mean why would she? It hurts both her and the meet. But it's not a good enough explanation for me." Usain Bolt Tells BBC Radio He Thinks Tyson Gay Hates His Guts The press is making this out to be bigger than it is, as later Bolt says he and Gay are "cool but not the best of friends." Watch/Listen to the highlight of the interview here so you can see Bolt's mannerisms/tone or listen to the whole five-minute podcast here. Recommended Read Legends Sing Praise Of Roy Griak - Minnesota's XC Coach Of 33 Years This story is full of great anecdotes and is a must-read for any coach in the sport. Nagoya To Become World's Largest Women-Only Marathon In 2012 It's going to have up to 10,000. 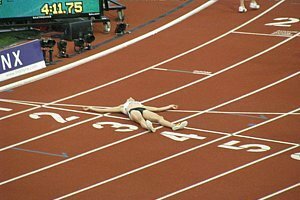 Science Of Sports Guys' Take On When We'll See The 2-Hour Marathon (80 Years From Now) This article is analyzing an academic paper that cites LetsRun.com and Chris Solinsky that is discussed in this thread. Profile Of Australia's 20-Year-Old Great Hope - Ryan Gregson It's inspiring to learn that the late Kerryn McCann played a role in getting him started in the sport. NPR Profiles The First Female Full Scholarship Track Athlete At Cal - A Woman Who Said "Nope To Dope" She said back then steroids were all over the place. 50 Bulls To Be Slaughtered When Rudisha Returns Home Rudisha is pumped and considers himself to be a true Masai warrior. (Non-Rudisha) Rieti: LRC Bernard Lagat Gets 3,000m American Record, Asbel Kiprop Wins Again, And Everyone (Especially Nesta Carter) Runs Fast In 100m Yesterday, Bob Kennedy turned 40. Today, he lost his last American record as a week after coming up short of the record, Bernard Lagat ran 7:29.00 to get the record and narrowly lost to Tariku Bekele in the process. In other action, Asbel Kiprop beat the top 1,500m field of the year and had time to celebrate a bit while doing it, and the men's 100m was super-fast as the first 7 all set personal bests, including Nesta Carter's world-leading 9.78. Someone check the timing the equipment in Rieti! If you're wondering about David Rudisha's 1:41.01 world record, that is covered here. Menjo Does It Again, Solos A 26:56 10k, Winning By Over 5 Minutes Menjo (he only needs one name) has put on 3 incredible solo performances in the last month in Finland. First it was a solo 12:55 5,000m, then a 3:53 mile and now it is a 26:56 10,000m where he won the race by over 5 minutes (there were only 2 other competitors in the race). American Chris Solinsky was the previous world leader in the event and with no major 10ks in the world this year, hoped to have the world leader stand. Instead, Menjo goes out and time trials a 26:56 by himself. Incredible. True Phenom: The Incredible Story Of Silas Kiplagat, Who Ran 3:29.27 For 1,500m In His First European Race Ever At Age 20 Silas Kiplagat started running two years ago thanks to the encouragement of Sammy Kitwara. Yes, the same Kitwara we highlighted last year: Sammy Kitwara: The Best Runner You've Never Heard Of. Because of Kitwara, Kiplagat wanted to run long distances, but coach Moses Kiptanui (former world record holder in the steeple) pushed him to the 1,500m. Thanks to the IAAF Focus on Athletes project and author Mutwiri Mutuota for letting us share this story with you. Kiplagat takes on Asbel Kiprop for the first time in Europe in a great 1,500m matchup Sunday in Rieti. Pete Julian Named Washington State XC Coach Julian was one of the guys who helped bring the US XC Champs to Boulder. Fasil Bizuneh Wins US 10-Mile Championships At Crim Congrats to Fasil for persevering and winning his first US crown at age 30.